It's the best of both worlds—the perfect crisp texture of an Asian pear and the sweet, juicy flavor of a European pear. Clearly, the name came easy. 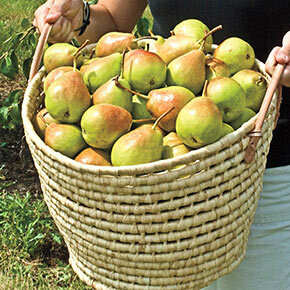 You're not going to want to miss a single pear, so it's a great thing these blooms are so frost tolerant—you'll be able to enjoy the exceptional harvest every year once the tree matures. Also, with many pears, there's a lot of struggle around picking and ripening, as they won't ripen on the tree. You have to find the perfect moment when it's mature but hasn't ripened to pick. Crisp 'n Sweet makes it easy, ripening beautifully on the tree in mid-August. This variety is also highly resistant to fire blight. Pyrus communis 'Green Jade' PP14034 Crisp 'n Sweet will need an ornamental pear in the vicinity for pollination. 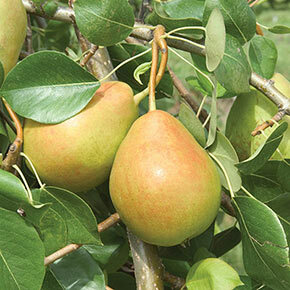 Ornamental pears are popular home-garden plants, so there should be some in the neighborhood. 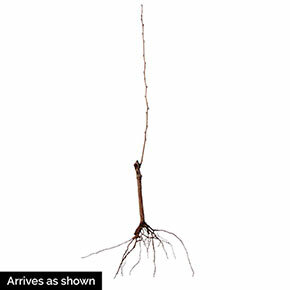 Pruning: Fruit thinning is required (remove fruit to one per cluster at fruit set) and it will not have premature fruit drop.